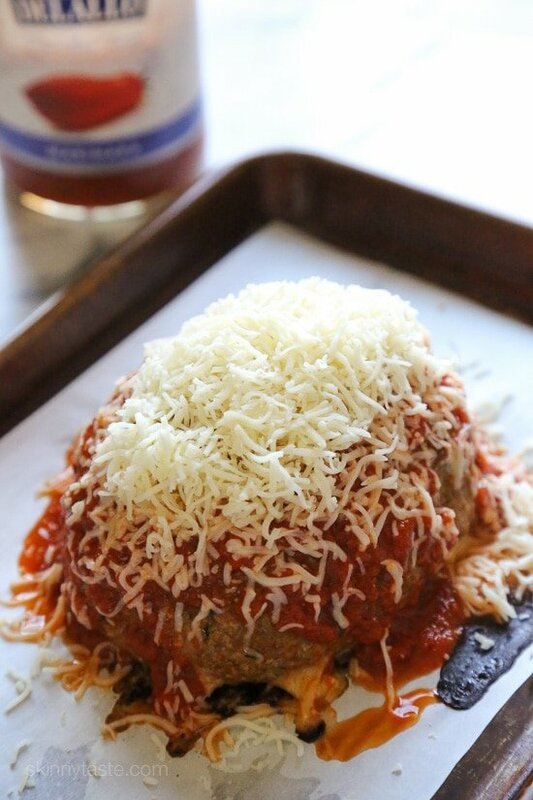 This Giant Turkey Meatball isn’t your regular meatball, is HUGE, baked in the oven similar to how you would make a meatloaf, then topped with marinara and melted cheese – I’m OBSESSED! This creation is a result of asking my husband what he wants for dinner. Tommy doesn’t care about eating light, so naturally he comes up with some decadent ideas, and because I love a challenge I had to make it work – the results, he LOVED it! I created this recipe in partnership with Delallo Foods. You’ve probably heard me talk about them before, I love working with them because I really love their products. For instance, I was a jarred marinara sauce snob (hey, I live in NY!) before I tried their jarred Pomodoro Fresco sauce. A had a jar to sample and reluctantly used it one night when I didn’t have time to cook. I was hooked, even my Italian husband approves so now I always keep a few jars on hand. Using their jarred sauce makes this SO quick and easy to prep. Although it takes a little time to bake in the oven, you’re freed up to do other things while it cooks. 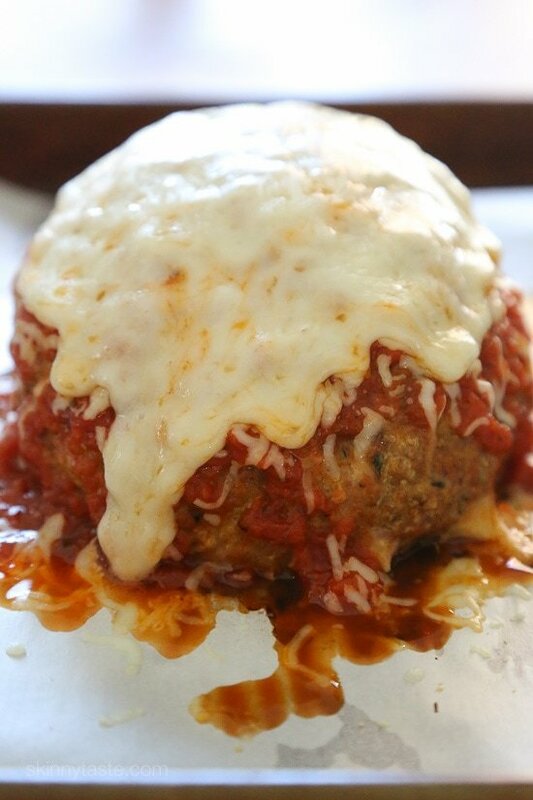 A few tips to make this perfect, don’t overwork the meat when mixing and when you form your giant meatball you want to make it a little flat on top so the sauce and cheese doesn’t roll off. We enjoyed this with a big salad, hope you love it as much as we do! 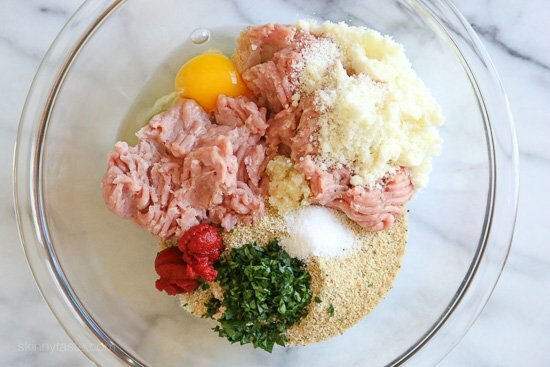 In a medium bowl combine turkey, breadcrumbs, pecorino, egg, garlic, tomato paste, parsley and salt and gently mix to combine. 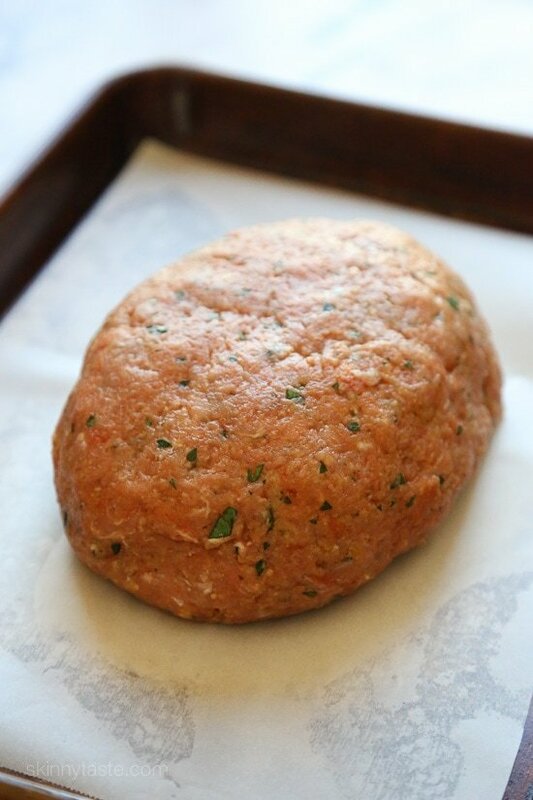 Form into an oval loaf using your hands, slightly flattened at the top on a nonstick baking sheet. Bake uncovered 50 to 55 minutes, or until it’s cooked in the center and the internal temperature of 160 °F with a thermometer. Remove from oven, top with marinara and cheese and bake 3 to 5 minutes until the sauce is hot and the cheese is melted. Slice in 8 equal pieces. Serve with more warmed sauce on the side if desired.